Rocker recliners have always been popular, and now there are many models and styles to choose from very conveniently online. You can find these comfortable chairs designed for small and large spaces, and some come with great additional features like swivels or massage features. If you are looking for the best rocker recliner and don’t know where to begin, the following tips will help you get started. We review some of the best rocker recliner models, compare top rated and popular models, and provide a buying guide with tips to assist you with conveniently shopping for the type of rocker chair that fits your needs the most. If you are looking for the best rocker recliner, we can help. 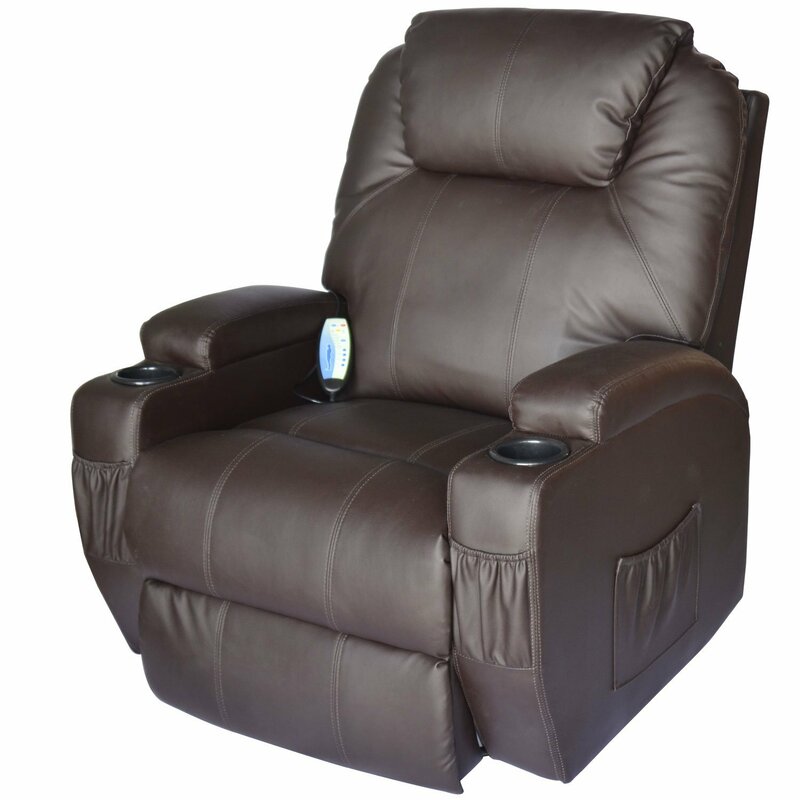 We have researched and compared brand quality, amount of comfort and support, along with overall value so you can confidently choose the best rocker recliner for your money. You can find brief reviews of our top picks showcased below. It comes with a steel base and hardwood frame that will provide you with years of comfortable support. The bonded leather upholstery is designed for comfort and it is also durable. You will appreciate the easy to use side lever that reclines the chair and extends the footrest. With plenty of padding throughout, you have all of the comfort and support you need to relax after a hard day. While the instructions and necessary hardware are included, some consumers have still mentioned that this rocker/recliner can be a little difficult to assemble. Roundhill Furniture designed the Brandan rocker recliner with value and style in mind. The bonded leather upholstery is durable and comfortable, and gives the chair a stylish appearance that will blend in with almost any room’s décor. Its oversized design if perfect for larger adults, and you will love how comfortable and supportive whether you are sitting upright or reclining. It features a steel base for the rocker and a hardwood frame that can withstand years of use. For added durability the chair joints are glued and pinned. The side lever is easy to pull, and you will love the extra support you get from the attached footrest. Measuring 39” x 39” X 41” this rocker recliner by Roundhill Furniture might be just what you need in your family or game room. 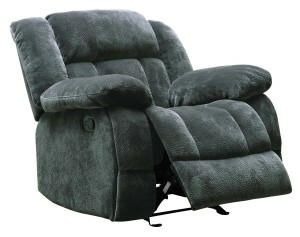 Not only can you rock and recliner, but this model also swivels. Its smaller size makes it perfect for compact spaces, including nurseries, dorms and studio apartments. You will love its stylish and contemporary design that looks great in almost any room. The Sutton swivel glider also comes with plenty of support and cushioning for incredible comfort. The only negative comments about the Sutton by Pulaski are its noticeably smaller size. This reclining chair is designed for smaller spaces and will probably not be comfortable for larger adults. While this does not affect its overall quality and value it is something that you will want to consider. One of the first aspects you’ll notice is its compact and stylish design. The soft microfiber upholstery is easy to care for, comfortable and gives the recliner a welcoming appearance. It comes with a drop coil system in the seat to ensure plenty of support, and to keep you comfortable it has plenty of padding in the seat, back and arms. The study base allows you to glide and swivel, and when the chair is reclined you can relax and put your feet up. The round tab is conveniently located underneath the arm for easy access and simply lean forward when you want the chair back in the upright position. 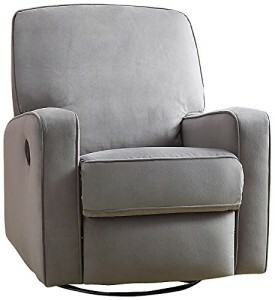 Measuring 36” x 39.5” x 31.5”, this rocker recliner will easily fit in smaller spaces. The back, seat and arms are overstuffed for exceptional comfort and support. 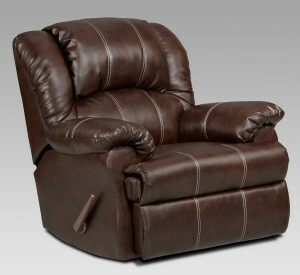 Its extra wide designed makes this rocker recliner the perfect choice for larger adults. All you have to do is pull the lever to recline in comfort. The leather upholstery gives this rocker recliner a stylish appearance that fits easily with almost any décor. While this rocker recliner from Flash Furniture has received mainly positive reviews some consumers have noted that it can be a little “squeaky” when rocking. If you are looking for an affordable rocker recliner that is durable and comfortable, then this might be the perfect choice for you. The leather upholstery is durable, stylish and comfortable to sit on, and you will love the extra padding. Not only does this ensure support and comfort for your back, but the arm and head rests are also padded. When it is in the upright position you can relax with the gentle rocking motion, and the side lever makes it easy to recline. The lever also brings the chair back up, and the attached footrest automatically folds down. To ensure leg comfort the footrest is also lightly padded. Since it measures 40” x 39.66” x 42”, it is also a great choice for larger adults. Rock, recline and spin 360 degrees in this comfortable chair from HomCom. The synthetic upholstery is durable, easy to care for and comfortable. The attached remote controls the 5 massage functions, along with a setting for heat. There are two cup holders on the arms, along with convenient front and side pockets. Some consumers have noted that the heating function does not always work. With some purchases this feature is included in the warranty, but this also means that it is important to read it carefully to see what all is covered. If you are looking for a reclining chair that does it all, then HomCom may have designed the perfect one for you. Not only can you rock and recline, this model also swivels a full 360 degrees. If you get chilly simply take advantage of the soothing heat function, and it can also massage muscle aches and pains away. There are five settings for the vibrational massage so you can easily find the right one to ease stress and reduce pain. The synthetic leather upholstery is designed to last for years, and there is also plenty of padding to ensure allover comfort and support. The remote control is attached so you don’t have to worry about losing it, and there are several pockets for convenient storage. To ensure you don’t have to keep getting back up, this rocker recliner also comes with two cup holders. The plush microfiber material is soft, comfortable and easy to care for. You will appreciate the extra padding throughout the chair, and larger adults will love its larger size. The side pull tab allows it to easily recline and also raises up the padded footrest. Its stylish and comfortable design makes this recliner rocker a great choice for dens, family and game rooms. Even though the plush microfiber material is extremely comfortable, it can also trap warmth which might not be ideal during hot summer months. You will love coming home and sinking into this comfortable oversized rocker recliner. The extra padding provides you with plenty of support, and its larger size ensures you have enough room to curl up comfortably. The gentle rocking motion will help you relax after a long day, and when you are ready to lie back the chair easily reclines. It is covered in a durable plush microfiber material that is incredibly easy to care for, and also look great with most decors. This chair can also be purchased as a part of a set so all of the furniture in the room can be matched beautifully. If you can make it to a store then we suggest that you take some time to sit in the various models. This will help you get a better idea of the right size, fabric and support, along with giving you a chance to try out a few of the optional functions. If you can’t make it into an actual brick and mortar store don’t worry you can still find a great rocker recliner simply by following our advice. The best rocker recliner reviews all agree that you want to take a couple of minutes and decide on a spending limit you are comfortable with. One of the first things that you will notice is that these chairs do vary dramatically in price. Materials used in construction, size, manufacturer and included features will all affect the cost of a recliner, and once you have set a spending limit you can start concentrating on the other factors. You do want to be careful and not try to save money by purchasing a cheap rocker recliner. When it comes to furniture you really do get what you pay for, and price will affect quality. You can find affordable rocker recliners that are designed to last, but you will probably have to give up a few extra features so you don’t have to sacrifice on quality. Rocker recliners have evolved and now you can find one to go in almost any space. When you are trying to decide between the various types it is important to keep in mind where it is going to be placed, and the overall design of the room. Even the best rocker recliner can look out of place if it is not right for the size and style of the room. There are three basic types of recliners and each has its own best uses. 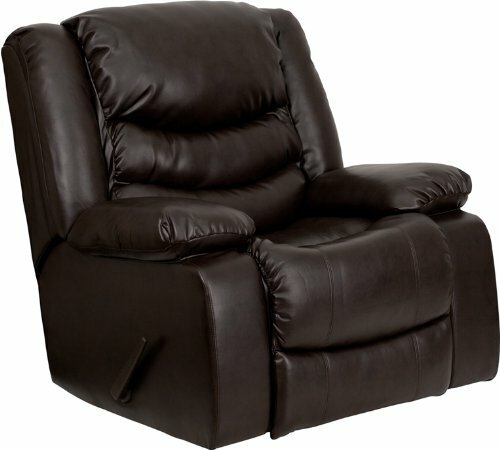 Sometimes referred to as “traditional recliners” these are still some of the most popular types of rocker recliners. As the name implies you have your choice of two positions, upright and fully reclined. When the chair is in the upright position it can also rock. These chairs can be found in a variety of styles designed to fit in almost any room, though it should be noted that they are not intended to be used in small spaces. A small lever or tab is used to recline the chair, and it typically comes with an attached footrest. Going “tiny” is a growing business and with more Americans moving to smaller spaces they need furniture that will fit. Wall-saver recliners are a great option for anyone that wants to have a comfortable place to sit and relax in their tiny house or small apartment. Not only do these chairs fit in compact spaces, many are also designed to have more than two reclining positions. Like traditional rocker recliners you can only rock when the chair is fully upright, but the footrest can usually be extended in any position. These chairs are similar to traditional models, but do not come with a pull tab or lever. Instead you press manually against the back of the chair when you want it to recline. This also gives these chairs a more sleek and modern design that looks great in contemporary style homes. While you can only take advantage of the gliders when it is upright, you can often choose between an attached footrest and a separate matching ottoman. This gives you a little more freedom when you are trying to find the perfect place to put it. Once you’ve decided on the type of rocker recliner it is time to consider the upholstery. Cost, style, feel and durability will all factor into your decision, and there are several materials to choose from. Here are the most popular and the advantages and disadvantages that come with them. This material looks great in offices, studies, dens and family rooms, and it is also resistant to fire. It can also feel incredible to sit on and help keep you comfortable for hours. The quality of leather will vary and it can be difficult to care for. If you want your leather rocker recliner to last for years you do have to be willing to pay a higher price. Cotton is one of the most popular types of upholstery for rocker recliners, and it also extremely affordable. The material is extremely easy to care for, absorbent, and generally comfortable to sit on. Cotton/microfiber can wrinkle easily, though this is rarely an issue with furniture, and it should be noted that it is not fire retardant. The quality of this material has improved dramatically in recent years, but some consumers still insists that it has an artificial feel. Otherwise the fabric is extremely durable, stain resistant and easy to care for, which often makes it the best choice for a child’s rocker recliner. Even though this material is similar to wool and easy to care for, acrylic is still not a popular choice with consumers. The upholstery can be easily damaged, and it is also susceptible to fire. If you live in colder climates a wool rocker recliner might be a good choice, but this material is priced higher than cotton and polyester. It is durable and can last for years, but only if it is well maintained. Wool can also be slightly “itchy” and is prone to fading over time. Along with deciding if you want a manual or lever/tab rocker recliner there are a few other features that you might want to consider. If you have trouble standing or sitting you might want to consider a lift rocker recliner. An electric model can also give you the option of easily relining and raising the chair with the press of a button. Some rocker recliners also come with massaging functions, which is always nice at the end of a hard day. It should be noted that these chairs will cost more, and the size and style can be limited. Other features that you might want to look for include handy side pockets and cup holders. Not only will this give you a place to put your drink, but the pockets can keep small books, magazines and the remote control close by. 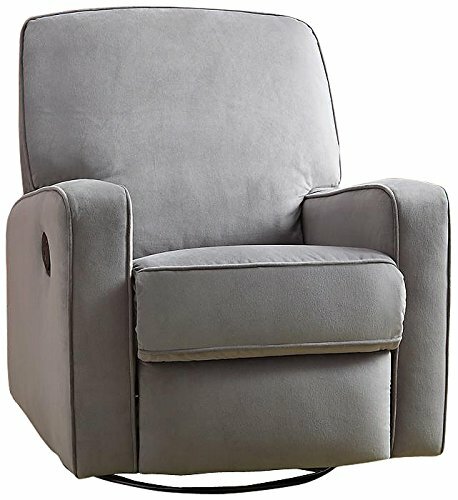 If you just take a few minutes and think about what you actually want in a rocker recliner you can easily find the best one without having to go to an actual store. We hope that these tips make it a little easier for you, and we wish you a relaxing and stress free day.